"Silver Birch" redirects here. For the racehorse, see Silver Birch (horse). Betula pendula, commonly known as silver birch, warty birch, European white birch, or East Asian white birch, is a species of tree in the family Betulaceae, native to Europe and parts of Asia, though in southern Europe it is only found at higher altitudes. Its range extends into Siberia, China and southwest Asia in the mountains of northern Turkey, the Caucasus and northern Iran. It has been introduced into North America, where it is known as the European white birch, and is considered invasive in some states in the United States and in parts of Canada. The tree can also be found in more temperate regions of Australia. The silver birch is a medium-sized deciduous tree that owes its common name to the white peeling bark on the trunk. The twigs are slender and often pendulous and the leaves are roughly triangular with doubly serrate margins and turn yellow in autumn before they fall. The flowers are catkins and the light, winged seeds get widely scattered by the wind. The silver birch is a hardy tree, a pioneer species, and one of the first trees to appear on bare or fire-swept land. Many species of birds and animals are found in birch woodland, the tree supports a wide range of insects and the light shade it casts allows shrubby and other plants to grow beneath its canopy. It is planted decoratively in parks and gardens and is used for forest products such as joinery timber, firewood, tanning, racecourse jumps and brooms. Various parts of the tree are used in traditional medicine and the bark contains triterpenes which have been shown to have medicinal properties. The silver birch is a medium-sized deciduous tree, typically reaching 15 to 25 m (49 to 82 ft) tall (exceptionally up to 31 metres (102 ft)), with a slender trunk usually under 40 cm (16 in) diameter. The bark on the trunk and branches is golden-brown at first, but later this turns to white as a result of papery tissue developing on the surface and peeling off in flakes, in a similar manner to the closely related Paper birch (B. papyrifera). The bark remains smooth until the tree gets quite large, but in older trees, the bark thickens, becoming irregular, dark and rugged. Young branches have whitish resin warts and the twigs are slender, hairless and often pendulous. The buds are small and sticky, and development is sympodial, that is to say the terminal bud dies away and growth continues from a lateral bud. The species is monoecious with male and female catkins found in the same tree. Some shoots are long and bear the male catkins at the tip, while others are short and bear female catkins. The immature male catkins are present during the winter but the female catkins develop in the spring, soon after the leaves unfurl. The leaves have short slender stalks and are 3 to 7 cm (1.2 to 2.8 in) long, triangular with broad, untoothed, wedge-shaped bases, slender pointed tips and coarsely double-toothed, serrated margins. They are sticky with resin at first but this dries as they age leaving small white scales. The foliage is a pale to medium green and turns yellow early in the autumn before the leaves fall. In mid-summer, the female catkins mature and the male catkins expand and release pollen, and wind pollination takes place. The small 1 to 2 mm winged seeds ripen in late summer on pendulous, cylindrical catkins 2 to 4 cm (0.8 to 1.6 in) long and 7 mm (0.3 in) broad. The seeds are very numerous and are separated by scales, and when ripe, the whole catkin disintegrates and the seeds are spread widely by the wind. Silver birch can easily be confused with the similar downy birch (Betula pubescens). 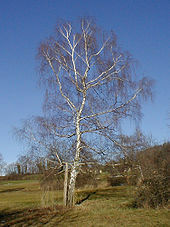 Yet, downy birch are characterised by hairy leaves and young shoots whereas the same parts on silver birch are hairless. The leaf base of silver birch is usually a right angle to the stalk while for downy birch it is rounded. In terms of genetic structure the trees are quite different but do, however occasionally hybridise. The larvae of a large number of species of butterflies, moths and other insects feed on the leaves and other parts of the silver birch. In Germany, almost 500 species of insect have been found on silver and downy birch including 106 beetles and 105 lepidopterans, with 133 insect species feeding almost exclusively on birch. Birch dieback disease can affect planted trees, while naturally regenerated trees seem less susceptible. This disease also affects Betula pubescens and in 2000 was reported at many of the sites planted with birch in Scotland during the 1990s. In the United States, the wood is attacked by the bronze birch borer (Agrilus anxius), an insect pest to which it has no natural resistance. Betula pendula is considered a species of least concern by the IUCN Red List. The synonym Betula oycowiensis (as B. oycoviensis) was previously listed on the Red List as vulnerable, though it is now considered a synonym of Betula pendula subsp. pendula. Betula szaferi was previously considered extinct in the wild on the Red List, but is now considered a form of B. pendula with the presence of a mutant gene, causing it to grow weakly and fruit heavily. Silver birch wood is pale in colour with no distinct heartwood and is used in making furniture, plywood, veneers, parquet blocks, skis, kitchen utensils and in turnery. It makes a good firewood that produces a good heat when burnt but is quickly consumed by the flames. Slabs of bark are used for making roof shingles and strips are used for handicrafts such as wooden footwear and small containers. Historically, the bark was used for tanning. Bark can be heated and the resin collected; the resin is an excellent waterproof glue and useful for starting fires. The thin sheets of bark that peel off young wood contain a waxy resin and are easy to ignite even when wet. The dead twigs are also useful as kindling for outdoor fires. The outer part of the bark contains up to 20% betulin. The main components in the essential oil of the buds are α-copaene (~10%), germacrene D (~15%) and δ-cadinene (~13%). Also present in the bark are other triterpene substances which have been shown to have anti-inflammatory, antiviral and anti-cancer properties. 'Carelica' or "curly birch", called "visakoivu" in Finland. The wood is hard and burled throughout; it is prized for its decorative appearance and is used in wood-carving and as veneer. 'Laciniata' agm (commonly misidentified as 'Dalecarlica') has deeply incised leaves and weeping branches. 'Tristis' agm has an erect trunk with weeping branchlets. 'Youngii' has dense, twiggy weeping growth with no central leader and requires being grafted onto a standard stem of normal silver birch. ^ English Names for Korean Native Plants (PDF). Pocheon: Korea National Arboretum. 2015. p. 373. ISBN 978-89-97450-98-5. Archived from the original (PDF) on 25 May 2017. Retrieved 26 January 2017 – via Korea Forest Service. ^ a b c d e f Vedel, Helge; Lange, Johan (1960). Trees and Bushes. Methuen. pp. 141–143. ISBN 978-0-416-61780-1. ^ a b Vakkari, P. (2009). "Silver birch (Betula pendula)" (PDF). EUFORGEN Technical guidelines for genetic conservation and use. ^ a b c d Featherstone, Alan Watson. "Silver birch, downy birch". Trees for Life. Retrieved 2014-05-28. ^ "Betula pendula". Germplasm Resources Information Network (GRIN). Agricultural Research Service (ARS), United States Department of Agriculture (USDA). Retrieved 2014-05-29. ^ a b "Silver birch: Betula pendula". Forestry Commission. Retrieved 2014-05-28. ^ a b "European White Birch – Betula pendula" (PDF). USDA Forest Service. 2006-09-01. Retrieved 2014-05-29. ^ Diamond, Joshua; Browning, Mark; Williams, Andrew; Middleton, John (2003). "Lack of Evidence for Impact of the European White Birch, Betula pendula, on the Hydrology of Wainfleet Bog, Ontario". Canadian Field-Naturalist. 117 (3). ^ a b c d "Betula pendula Roth". Plants of the World Online. Royal Botanical Gardens Kew. Retrieved 2018-10-28. ^ a b Hunt, D., ed. (1993). Betula. Proceedings of the IDS Betula Symposium 2–4 October 1992. p. 51. International Dendrology Society ISBN 0-9504544-5-1. ^ OECD (2008). Novel Food and Feed Safety SET 1: Safety Assessment of Transgenic Organisms OECD Consensus Documents Volumes 1 and 2. OECD Publishing. p. 58. ISBN 978-92-64-05346-5. ^ Anderberg, Arne (1999-10-14). "Betula pendula Roth". Den virtuella floran. Naturhistoriska riksmuseet. Retrieved 2014-05-29. ^ Govaerts, R. (1996). "Proposal to reject the name Betula alba (Betulaceae)". Taxon. 45: 697–698. doi:10.2307/1224262. ^ Setälä, Heikki; Huhta, Veikko (1991). "Soil Fauna Increase Betula pendula Growth: Laboratory Experiments With Coniferous Forest Floor". Ecology. 72 (2): 665–671. doi:10.2307/2937206. JSTOR 2937206. ^ "HOSTS – a Database of the World's Lepidopteran Hostplants". Natural History Museum. Retrieved 2014-05-29. ^ Brändle, Martin; Brandl, Roland (2001). "Species richness of insects and mites on trees: expanding Southwood". Journal of Animal Ecology. 70 (3): 491–504. doi:10.1046/j.1365-2656.2001.00506.x. ^ "Birch, downy (Betula pubescens)". Woodland Trust. Retrieved 10 May 2016. ^ "Dieback of birch". Forestry Commission. Retrieved 10 May 2016. ^ a b Cox, Michael O. "Firewood types: silver birch". WoodstoveWizard.com. Retrieved 2014-05-29. ^ Julie Lindahl (2011-01-09). "Bark Bread is back". Nordic Wellbeing. Retrieved 2011-07-21. ^ "Betula pendula – Roth". Plants for a future. Retrieved 2014-11-05. ^ Demirci, Betül; Paper, Dietrich H.; Demirci, Fatih; Başer, K. Hüsnü Can; Franz, Gerhard (2004). "Essential Oil of Betula pendula Roth. Buds". Evidence-Based Complementary and Alternative Medicine. 1 (3): 301–303. doi:10.1093/ecam/neh041. PMC 538512. PMID 15841263. ^ Kovac-Besović, E. E.; Durić, K.; Kalodera, Z.; Sofić, E (2009). "Identification and isolation of pharmacologically active triterpenes in Betuale cortex, Betula pendula Roth., Betulaceae". Bosnian Journal of Basic Medical Sciences. 9 (1): 31–38. PMID 19284392. ^ Katriina Anttila (2005). "Suomen kansallistunnukset (Finland's national emblems)". Retrieved 2014-05-30. ^ "Perinteinen saunavihta (Traditional sauna vihta)". Visit sauna. Retrieved 2014-05-30. ^ Botanica (1999). Botanica's Trees & Shrubs. Laurel Glen Publishing A. p. 139. ISBN 978-1-57145-649-6. ^ "Betula pendula var. carelica – curly birch". Arboretum Mustila. Retrieved 2014-11-12. ^ "RHS Plant Selector – Betula pendula 'Laciniata'". Royal Horticultural Society. Retrieved 2013-06-14. ^ "RHS Plant Selector – Betula pendula 'Purpurea'". Royal Horticultural Society. Retrieved 2014-11-12. ^ "RHS Plant Selector – Betula pendula 'Tristis'". Royal Horticultural Society. Retrieved 2013-06-14. ^ "RHS Plant Selector – Betula pendula 'Youngii'". Royal Horticultural Society. Retrieved 2014-11-12. Wikimedia Commons has media related to Betula pendula.